This annual project benefits approximately 60 – 70 families. Children with families in need take home canned and boxed food every Friday for meals to prepare and eat on the weekend. Once a month the Kiwanis Back Pack Program packs 4 -5 weeks of food for the children to take home to their families. 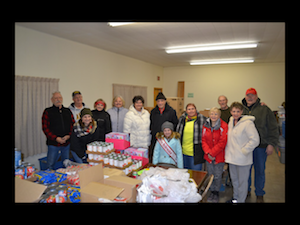 In February, the Seward Optimist Club helps the Kiwanis Club sack up the food for the upcoming month. A box of Valentines from the Optimists for the children to use for their school is added for a valentine party.